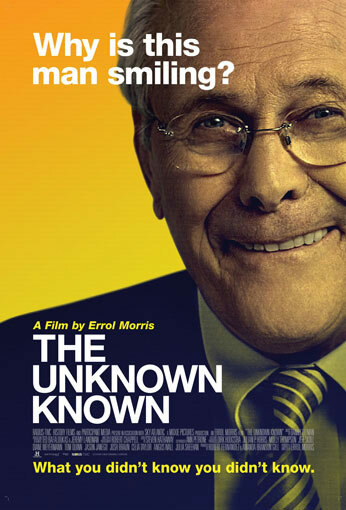 In The Unknown Known, Academy Award-winning director Errol Morris (THE FOG OF WAR) offers a mesmerizing portrait of Donald Rumsfeld, the larger-than-life figure who served as George W. Bush’s secretary of defense and as the principal architect of the Iraq War. Rather than conducting a conventional interview, Morris has Rumsfeld perform and explain his “snowflakes” — the enormous archive of memos he wrote across almost fifty years in Congress, the White House, in business, and twice at the Pentagon. The memos provide a window into history — not as it actually happened, but as Rumsfeld wants us to see it. By focusing on the “snowflakes,” with their conundrums and their contradictions, Morris takes us where few have ever been — beyond the web of words into the unfamiliar terrain of Rumsfeld’s mind. The Unknown Known presents history from the inside out. It shows how the ideas, the fears, and the certainties of one man, written out on paper, transformed America, changed the course of history — and led to war.